Curious about how we can transform your existing kitchen with custom cabinets without the typical mess of a rip-out? Read our FAQ section to find out more! 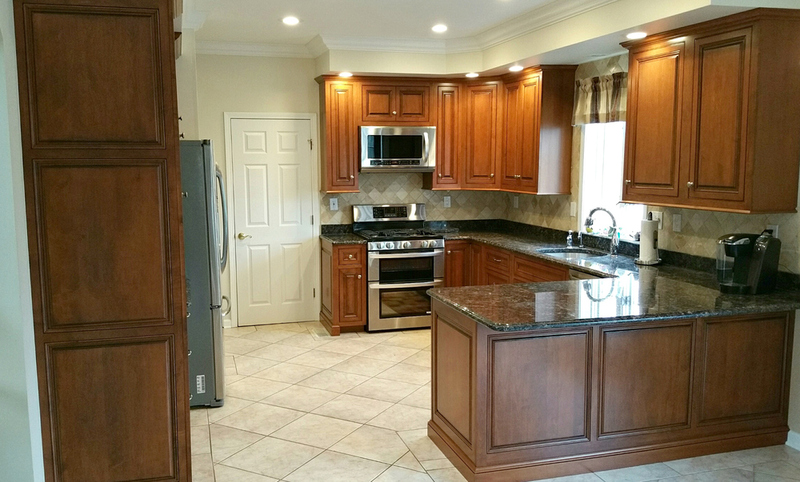 How Are WE the Alternative to Standard Kitchen Cabinet Refacing & New Custom Cabinets? Are you tired of the look and feel of your existing kitchen cabinets? Do you dream of a new kitchen, yet dread the idea of a kitchen rip-out? Are you hoping to express your design ideas and personal sense of style? If you answered “yes” to these questions, you’ve come to the right place! Q: What makes your process better than standard cabinet refacing? A: Solid wood face frames instead of easily damaged wood veneer or formica. The veneer applied to cabinet face frames during standard refacing is just 1/32" thick. It can delaminate or be damaged easily. Our approach gives your existing cabinets an entirely new, 3/4" thick face frame that we install directly over the old face frame. Unlike wood veneer, our face frames will never delaminate, tear, or crack from impact damage. Q: Why would I want to reuse my existing cabinets? Aren't new cabinets better? A: Modern cabinets are still made the same way as existing cabinets, and most dated kitchens we see have nicer cabinets in them than brand-new stock cabinets. If your kitchen layout is functional, then throwing out your cabinets is throwing out money! New cabinets do not inherently give you a better value than custom components built over your existing foundation. Many new cabinets are made with imported fiber-board and inferior hardware to cut costs. We believe in investing in high quality components and a meticulous installation, rather than replacing your structurally sound and valuable cabinet boxes. Q: I heard someone else saying they can put wood on the front of my cabinets, that's the same as what you're doing, right? A: Our unique process utilizes 3/4" solid wood frames custom made for your kitchen, not strips cut on a saw in your garage. Other options may refer to solid wood, or wood strips - and that will be 1/4" thick material, not 3/4" thick custom frames. Solid wood that is only 1/4" thick can only be nailed or stapled on through their face, and will be prone to splitting easily. If plywood is used the edge inside the opening is often left untreated, resulting in an unattractive seam right when you open the door.